Why do I need Diabetic Footwear? Can you answer yes to any of these foot problems? â–¡ Previous amputation of the foot or toes? â–¡ Previous foot ulcerations or sores? â–¡ Pre-ulcerative calluses or sores? â–¡ Peripheral neuropathy or loss of feeling in your feet? Today’s Diabetic Shoes Fit Your Lifestyle! When people hear the term “therapeutic shoes”, they often think of ugly, bulky, old black shoes. 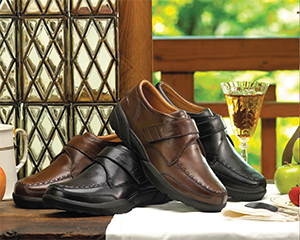 Today’s diabetic shoes come in many beautiful colors and styles–just like regular shoes. Providers today understand that if you don’t love your shoes, you won’t enjoy the health benefits because you simply won’t wear them. 60-70% of diabetics have mild to severe forms of nervous system damage resulting in impaired sensation in the feet. When you combine a loss of protective sensation with improper or ill-fitting footwear, sores may develop because of rubbing, slipping, or shearing. Simply put, if your nerve endings can’t feel what’s happening to your feet, they can’t send the proper messages to your brain when your feet need special attention or protection. Nerve damage from diabetes is called diabetic neuropathy (new-ROP-uh-thee). About half of all people with diabetes have some form of nerve damage. It’s more common in those who have had the disease for a number of years and can lead to many kinds of problems. Over time excess blood glucose can injure the walls of tiny blood vessels that nourish your nerves, especially in the legs. Nerves send messages to and from your brain about pain, temperature and touch. They tell your muscles when and how to move. They also control body systems that digest food and pass urine. Contact AllCare Foot and Ankle and we will help you pick out the shoe that fits your lifestyle.